The “Project for Japan-Caribbean Climate Change Partnership” will seek to provide eight Caribbean countries with $15 million for preparing and designing their Nationally Appropriate Mitigation Actions (NAMAs) and National Adaptation Plans (NAPs) under the UNFCCC. The initiative will help Guyana, Grenada, Jamaica, Suriname, St Vincent and the Grenadines, St Lucia, Dominica and Belize build their capacity to cope with climate change. 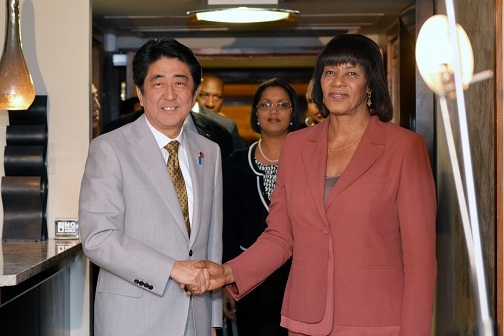 The agreement was signed on the margins of the first ever Japan-Caricom summit in Trinidad, attended by Japanese Prime Minister Shinzo Abe and several Caricom heads of government. The agreement aims at assisting Caribbean countries in developing and implementing climate change policies such as National Appropriate Mitigation Actions and National Adaptation Plans and to promote technology transfers in adaptation and mitigation technologies through various pilot projects such as water supply systems and/or irrigation facilities for communities and photovoltaic panels in selected countries. It will also seek to build a regional platform for information sharing. Japan is also providing assistance to Caribbean countries, through the Barbados-based Caribbean Development Bank (CDB) and the Inter American Development Bank (IDB), in the development of renewable energy. A “Memorandum of Cooperation (MOC) on Promotion of Renewable Energy and Energy Efficiency in the Eastern Caribbean Region” was signed here yesterday between the IDB, the CDB and the Japan International Cooperation Agency (JICA). Countries of the Eastern Caribbean region have been tackling high energy costs and are seeking to reduce dependence on fossil fuel-generated energy by diversifying energy grids and promoting renewable energy and energy efficiency as a matter of urgency. The agreement was signed by Nigel Romano, CDB acting vice-president, and Toshiyuki Kuroyanagi, vice-president of Japan International Cooperation Agency. The MOC will formalise a non-exclusive framework of cooperation and facilitate collaboration among CDB, IDB and JICA to promote programmes and projects that foster cooperation among them, and explore a joint effort for further introduction of renewable energy and energy efficiency in the Eastern Caribbean region, with special focus on geothermal development. Under the agreement, the CDB, IDB, and JICA will further explore possibilities of concessional loans for the CDB from IDB and JICA, implementation of technical assistance which will help the partner countries.